Boasting one of the most beautiful rivers in Cambodia, Kampot has kayaking that is suited to both beginners and those looking for a challenge. For skilled kayakers, the Tuek Chhou Rapids located 10 kilometers from Kampot town offer a bit of a challenge. For those of us just starting out or preferring a more laid back experience, roughly 5 kilometers from Kampot town is a lazy offshoot of the Tuek Chhou River known as the Green Cathedral or Green Loop. The Green Cathedral is named for the foliage the lines the waterway. Along the way, you will pass through areas where the plants have grown to a size that allows them to touch leaves across the water, forming a peaceful canopy that filters out a bit of the blazing Cambodian sun. As Kampot grows, more guesthouses and residences are springing up and threatening the canopy. For now there is still a good amount of nature to enjoy, but don’t wait too long to make your trip. Getting to the Green Cathedral is a 10 to 20 minute moto or tuk tuk ride north out of town on the Red Road. Kayaks are available for rent at guesthouses along and near the Green Cathedral such as Retro Kampot, Meraki, and, most prominent, Bopha Prey Riverside Guesthouse which is located on Tuek Chhou River at the entrance to the Green Cathedral. Kayaks at most locations are available for either one or two people. Piloting a two-person kayak on your own is more difficult, but sitting in the rear seat allows you the best control in case a solo craft is not available to you. Dragonfly enthusiasts will get their fill as there are plenty of sizes, shapes, and colors of the lively insects darting about. Especially once you get to the area of the Cathedral that opens up into more of a lake. Among the lily pads there, you can see water fowl swimming by or doing a bit of fishing of their own for a meal. Don’t let stories of crocodiles bother you, there is no chance you’ll see any in Kampot! Along the way, you will pass under several bamboo style bridges and two concrete bridges. The concrete bridges let you know that you are about to arrive at the Tuek Chhou River. 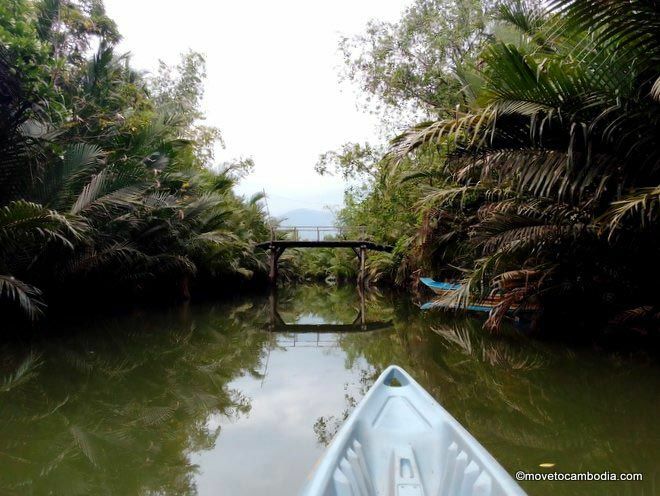 Depending on where you rented your kayak, you may find yourself paddling on Tuek Chhou for 100 meters or more. Don’t worry! Stay close to the shore line and not only will you see more wildlife, you will avoid the larger longtails that travel in the channel. Kayaking takes minimal preparation. Be sure to put on sunblock and bug spray before setting out. It is advised to take some drinking water with you and wearing a hat or sunglasses is optional, but advised. Also do a bit of stretching beforehand to avoid soreness the next day. You will get a (or a lot) wet so bring a change of clothes. People who are not strong swimmers should be sure to wear a life vest. While the Green Cathedral is not a terribly deep body of water, it is always better to be safe than sorry! Travelers with limited mobility may find it more enjoyable to travel by boat tour as there are not many accessible kayak launching areas. Hint for the camera lovers, wet bags can be a life saver for electronics. Alternately, secure your camera around your neck on a lanyard. It is difficult to balance your paddle while getting a good picture so having your camera on a lanyard can stop a day ruining accident. 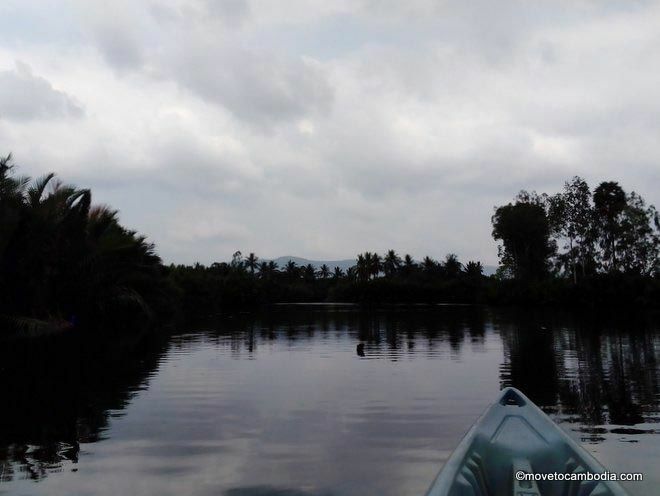 This entry was posted in Kampot and tagged Tuek Chhou, Kampot river. Bookmark the permalink.